1. How is “tunneling” accomplished in a VPN? 4. Which statement correctly describes IPsec? 5. What is an IPsec protocol that provides data confidentiality and authentication for IP packets? 7. What key question would help determine whether an organization should use an SSL VPN or an IPsec VPN for the remote access solution of the organization? 8. What is the purpose of a message hash in a VPN connection? 9. A network design engineer is planning the implementation of a cost-effective method to interconnect multiple networks securely over the Internet. Which type of technology is required? 10. What is one benefit of using VPNs for remote access? 11. Which statement describes a characteristic of IPsec VPNs? IPsec can secure traffic at Layers 1 through 3. IPsec encryption causes problems with routing. 12. What is the purpose of the generic routing encapsulation tunneling protocol? 13. Which algorithm is an asymmetrical key cryptosystem? 14. A network design engineer is planning the implementation of an IPsec VPN. Which hashing algorithm would provide the strongest level of message integrity? 16. Which statement describes a feature of site-to-site VPNs? 17. Which Cisco VPN solution provides limited access to internal network resources by utilizing a Cisco ASA and provides browser-based access only? 19. Which function of IPsec security services allows the receiver to verify that the data was transmitted without being changed or altered in any way? Open the PT Activity. Perform the tasks in the activity instructions and then answer the question. What problem is preventing the hosts from communicating across the VPN tunnel? 21. What is the purpose of utilizing Diffie-Hellman (DH) algorithms as part of the IPsec standard? 23. Two corporations have just completed a merger. The network engineer has been asked to connect the two corporate networks without the expense of leased lines. Which solution would be the most cost effective method of providing a proper and secure connection between the two corporate networks? 24. Which remote access implementation scenario will support the use of generic routing encapsulation tunneling? Chapter 7 is also a practical test in PT. I finished the test with a score of 89. I loaded my answers here http://we.tl/sVxPUc6lIX. Hope to help you. My exam is tomorrow and the link not working can you please repost it. 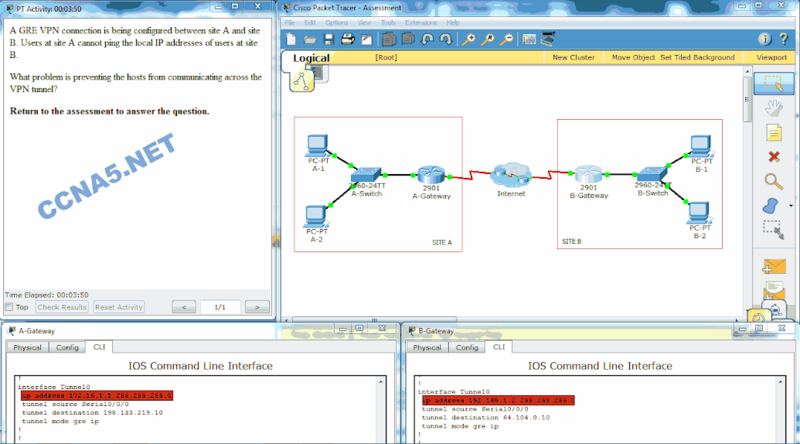 Chapter 7 is also a practical test in Packet Tracer. I finished the test with a score of 89. I loaded my answers here http://we.tl/sVxPUc6lIX. Hope to help you. Can you resend it please. Any one have the Chapter 7 Practice Skills Assessment – PT answers? Thank you for your answer but the link do not work any more .